If you’ve been keeping up with our Profiles in Power, you’ll know that we believe in the power of pregnancy fitness. A good workout – whether light or intense – can bring about a sense of strength you didn’t know you had. And, at the same time making a commitment to yourself and following a routine does the same thing for your inner strength. Especially when you need it most. This is what happened for Aimee Nicole (who can be found on Instagram: @aiming4fitness). When her little boy was sick, fitness was her outlet. While he was recovering, making a commitment to herself helped to transform her. 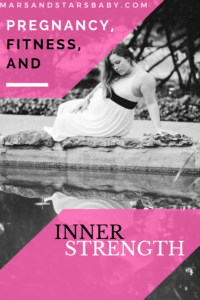 Now, nearing the end of her second pregnancy, we talk exercise, self-care, self-love, and of course – inner strength. For most of us, when we think fitness we think health and strength. For Aimee, fitness also means mental health and mental strength. Although he’s now totally cancer-free, when her son was two, Aimee had to deal with the unthinkable. Her little family lived in the hospital. To say that the times were trying wouldn’t begin to describe her life. That’s when she picked up running. For an outlet. For an escape. To get away. She lived only a few minutes away, so she would go for a run downtown between her home and the hospital. Running cleared her mind, let her focus, and helped her cope. This pregnancy is a polar opposite from her first. She feels more fit, energetic, and expects to recover quicker. She loves that this time around she has some muscle tone. Aimee does emphasize having to listen to her body more. This includes not overexerting herself, making sure her stomach doesn’t “cone”, and not pushing herself as hard. Aimee mentioned that her doctors were supportive and encouraging of her decision to stay fit. They said that since she was working out before – she should continue. “And then there’s Youtube” – Aimee’s fitness inspiration both pre and during pregnancy. Aimee listed Whitney Simmons as one of her faves, but she’s always on the lookout for a new way to mix it up. To challenge her body. “I would just look up pregnancy workouts from people who had experienced it to see their perspective.” That’s great advice. There’s no one-size-fits-all model, but might as well check out what worked for others. And at the same time, she stresses the importance of listening to your body and slowing down when it tells you to. Even though it’s the hardest thing ever for a go-go-go person like her. It’s a touchy subject, but we went there anyway. I asked her about body image as a new and future mom. Aimee was quick to respond how much it hurts her when women hate their bodies, obsess over stretch marks or being a certain weight. “We created a human being – our body is amazing!” she exclaims. What opened her eyes the most was her son’s cancer. “My son has scars all over his body, my stretch marks are nothing.” Such great perspective to keep in mind when passing by the mirror in the morning. Then she was quick to joke that when you have muscle tone you just look good. A little pregnancy won’t make any difference. When Aimee and I spoke she was 8 months pregnant, but she’s cuddling with the new little man in her life as you’re reading this. When we talked about what’s next – Aimee mentioned her desire to incorporate fitness as a career in the future. If you take a look at her Instagram, you’ll agree with me that she totally belongs on Youtube as the next fitness inspiration. She laughs “You’re not the first person to tell me that”. I’m sure that’s true. A love for fitness and a personality to match is a winning combination! But more than anything, Aimee is just excited to have a bigger family. Her dream come true.